Sorry, but the Free Shipping portion of the 2018 Holiday Sale is now over. However, we may still have other Holiday Special Sale inventory available, see below! Did you miss the shipping sale? Sign up for Z-Mail and we'll notify you of all sales ahead of time! The 2018 Holiday Special Purchase Sale! 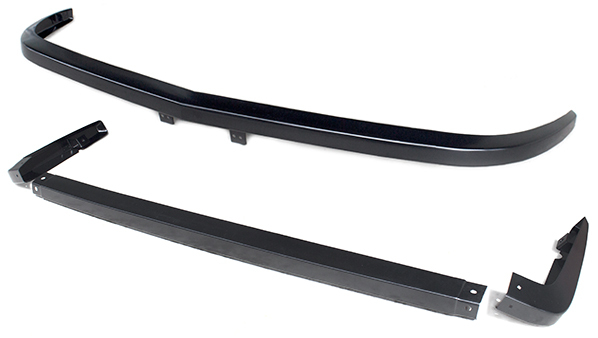 These Satin Black Metal Bumpers are smooth (designed to be used without rubber strips or bumper guards), but they retain the factory original shape and mounting brackets. The bumper is coated satin black to ensure a lasting, durable finish that is great for those who want metal bumpers that aren't chrome! Hardware, shims, and mounting brackets are available separately in complete installation kits. Special Purchase price of $239.95/each, limited to stock on hand. Because of the limited stock, we recommend calling (800)633-6331 to reserve yours. You can also order online (subject to prior sale): Front Bumper | Rear Bumper. The 2018 Holiday Closeout Special Sale! Unfortunately these awesome Z parking only signs are no longer being made. We only have a few left in some of the options, and they won't last long. If you've ever thought about picking one of these up for your Z's special parking space, this is your last chance! Because of the very limited stock remaining, we recommend calling (800)633-6331 to reserve yours. You can also order online (subject to prior sale): Z Only Parking Signs.